AMAZING OPPORTUNITY at the highly sought after VillaRosso in DTC! 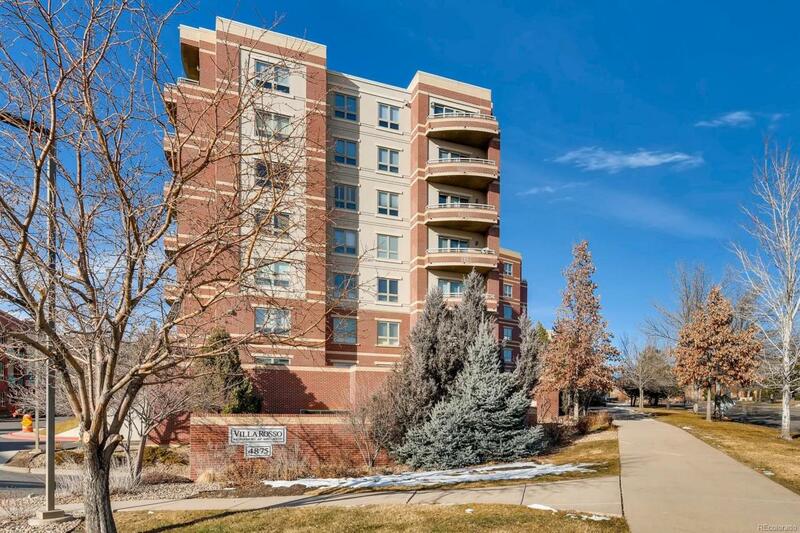 Pristine 5th floor end unit with soaring views of the front range! Pictures do not do justice to the magnificent panoramic experience off the oversized balcony, master bedroom and living room! Absolute perfect floorplan for entertaining with an open concept living and dining room adjacent to the kitchen. Master bedroom is privately located at the south end of the unit with a spacious 5 PC bath, walk-in closet and stunning mountain views! Second bedroom is located on the north end, streaming natural light with access to the full 2nd bath. Ideal office space off the living room with even more mountain views if that's possible! Plantation shutters and crown molding throughout provide an elegant touch to the interior. Secure entrance with a gorgeous lobby for guests to wait upon entry. Two deeded parking spaces in the garage with a storage unit as well! This is an incredible opportunity for lock and leave living with luxury!